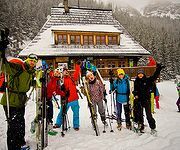 Ok so you didn't come all the way to the Tatras to find a Polish plumber, but we at Local Life know that from time to time visitors to the mountains need more than just a hotel for the night or a tip on a good restaurant. More mundane issues can have you hunting for that all important address or telephone number, and as usual we're here to help. In our services section you find listings of the likes of doctors, dentists, car hire companies and real estate agents for all your day to day needs. Is there a place to store luggage at the train station? If so, where, cost, etc? Thanks! Are there Any trains from Zacopane that run south? On my way to Budapest . Any info ? Thanks ! Very low medical care standart. Very low medical equipment standart like a third world. Waited their for hours (5) before they even looked at me after a ski injury. They have treated the locals who came after the foreigners before the foreigners. Staff laughter at me on my face when I was in pain- very unprofessional. When we complain they pretend not to understand English but understood very good what we said. I am planning a holiday in Zakopane next summer and need to find out details of local bus services in the area. I should be very pleased if you could let me know where I can get details, Thank you.